That the Birmingham area is gifted with great places to eat is no secret. But sometimes, the best dining spots take a little sleuthing to find. 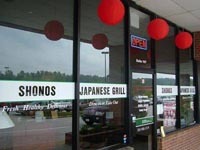 Colleen and I have decided that Shonos Japanese Grill in Riverchase is one such case. 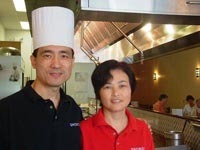 Eddie Cui and his wife Flora opened Shonos with a pretty simple idea in mind: Healthy food can be delicious and doesn’t have to drain your wallet. We think they’ve managed to achieve that goal. 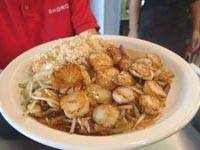 Available for dine-in or take-out, the Shonos menu includes veggie entrees along with chicken, shrimp, fish and scallops.Â The ‘Eddie’s Special’ entree offers steak marinated in Eddie’s custom blend of ingredients.Â A rib eye steak is also available. Eddie prides himself on preparing your meal without MSG. A chilled salad with Ginger dressing is standard with each entree, along with vegetables and your choice of steamed or fried rice. Soups and appetizers are also available, along with egg rolls. You won’t find the theatrics of chefs cooking at your table and tossing bits of food into customers’ mouths that’s so common with conventional Japanese steakhouses. But you will find food that’s just as delicious, and at much lower prices than what the big steakhouses charge (of the nine dinner entrees Shonos offers, five are less than $10). If you pay Shonos a visit, whatever you do, don’t overlook the squeeze bottles containing the mysterious white sauce. We didn’t know what it was on our first visit, until our server explained that it’s sauce for the shrimp. The sauce, it turns out, is another of Eddie’s special concoctions. And it’s outstanding. In fact, customers pour it, not just on shrimp, but on chicken and steak … and we’ve even seen diners using it as a salad dressing. Colleen and I have dined at Shonos several times now, and on each visit, the food and the service were excellent. There aren’t many places these days where two people can have a filling, healthy meal and still manage to get change from a $20 bill. Shonos is located at 1843 Montgomery Highway, Suite 107, in the same shopping center as Picadilly cafeteria and Dale’s Southern Grill, south of the Riverchase Galleria. Open Monday through Saturday for lunch, 11am until 2pm, and dinner from 5pm ’til 9pm. If you want to place an order to go, give Eddie or Flora a call at 988-3319. Shonos is just one more reason why living in Birmingham sure has its advantages. Enjoy! “Why is my credit score so important?” I had this conversation with my almost 19 year old son the other day. I realize that most young adults are unaware of credit scores and what they mean to their financial future. So, over dinner, my husband and I discussed with him the advantages of a high credit score. It’s another talk all parents need to have with their young. Credit scores range from 300-850. As one might expect, young adults typically average a much lower score than, let’s say, people in their 70’s. According to Experion, one of the three credit scoring and reporting agencies, the national average credit score is 678. Very low scores pull that average down. The average score here in Alabama is 671. What’s interesting, though, is that 60% of the population has a score of over 720. During our conversation, I advised to my son to protect his credit score at all costs. I think understanding the consequences of a low score will help a lot. When I explained that a low score would cost him money, he listened carefully. Right now, he has one credit card, but has never used it. I suggested he save up for something he wants to purchase, and put the money in his checking account. Then he could charge the item on his credit card and pay it off upon receiving his statement. I hesitated before that knowing how easy it is to make just the minimum payment. However, establishing some (good) credit is equally important. This is basic, but he found it quite informative. How many of us parents mistakenly assume our children automatically know how to manage money? So today, we are hearing about the “tight” mortgage money and how difficult it may become for someone to purchase a home. I say, if we protect our credit scores, it won’t be so bad, after all. What is wrong with a little bit of old fashioned responsibility?